Dogu, D., Tuncer, F. D., Bakir, D., and Candan, Z. (2017). 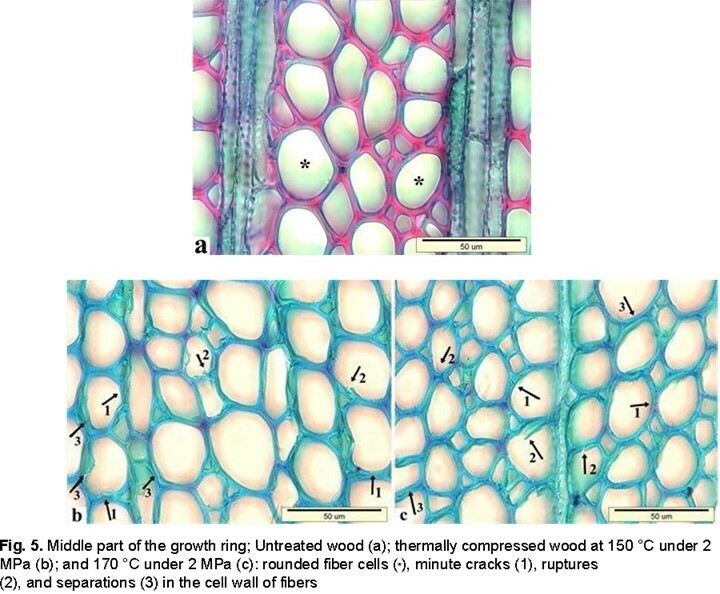 "Characterizing microscopic changes of paulownia wood under thermal compression," BioRes. 12(3), 5279-5295. 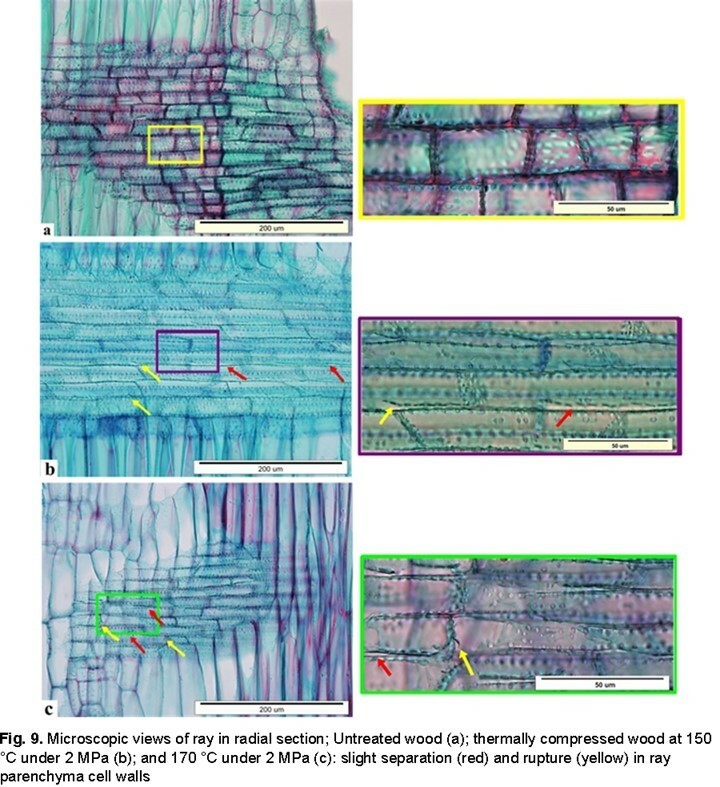 This study evaluates the microscopic changes of paulownia solid wood panels subjected to thermal compression via characterizing the changes in wood microstructure. The panels, with dimensions of 500 mm × 100 mm × 20 mm, were hot-pressed in a tangential direction by using a laboratory-type hot press at a temperature of either 150 °C or 170 °C and a pressure of 2 MPa for 45 min. Microscopic investigations conducted by light microscopy showed that slightly more damage occurred in the samples compressed at 170 °C and 2 MPa than at 150 °C and 2 MPa, and that the distribution of deformation in the panels was not uniform in the growth rings of the two treatment groups. The cell collapse was not observed in the microstructure of paulownia wood after the thermal compression. Cell shapes and their arrangement in the growth ring alongside loading direction were interpreted as effective factors governing the non-uniform distribution of damage and the lack of cell collapse in the microstructure. Wood is a unique, natural occurring, renewable, biodegradable, and relatively cost-effective material with outstanding axial stiffness-to-weight and strength-to-weight ratios (Bodig and Jayne 1982; Gibson and Ashby 1997; Dinwoodie 2000). These properties have led to wood being used extensively throughout the history of mankind. In recent years, there has been an increasing demand for industrial wood. However, there are some doubts as to whether timber production can continue to meet the increased needs of the forest products industry. Increases in the cost of wood material have necessitated finding low-cost wood species for the industry. To overcome this issue, fast-growing tree species such as paulownia, poplar, alder etc., have recently gained great attention (Hill 2006; Bekhta et al. 2016). However, fast-grown tree species restrict the industrial usage of the timbers obtained due to the negative effects of their low density on the mechanical and physical properties of the wood. Wood modification methods being developed for these particular wood species may help improve timber quality. Thermal compression is a combined modification method that possesses some chemical, thermal, and physical effects on wood (Hill 2006). The main purpose of applying compression and heat together on wood is to overcome the weakness associated with low wood density and to improve dimensional stability (Gong et al. 2010; Tu et al. 2014; Guo et al. 2015). Paulownia (Paulownia spp.) is one of the most successful fast growing tree species that is adaptive to diverse soils and climate conditions (Wang and Shogren 1992; Jey 1998). This tree species that originated from China, is obtained from plantation forests in Turkey (Akyildiz and Sahin Kol 2010). Paulownia wood is light-colored, soft, lightweight, easy to process, and generally knot free. Its wood is resistant to decay, dimensionally stable, straight-grained, easily air-dried without drying defects, resistant to splitting and warping, has a very low thermal conductivity, and a very high ignition point (Bergmann 1998; Kalaycioglu et al. 2005). Despite being abundantly available, its wood properties, such as low strength, low density, and low hardness, limit its end-use potential (Candan et al. 2013). Candan et al. (2013) examined the effect of thermal compression on some of the properties of paulownia wood panels. Their results showed that the moisture content of the panels decreased with increased press temperature. The initial moisture content values of unmodified wood panels were approximately 13%, whilst the moisture content values of the panels modified at 170 °C were nearly 9%. The mean density values of the panels decreased while the thickness swelling and water absorption values increased after thermal compression. Their study suggested that thermal modification processes could not produce an improvement in the density or dimensional stability of paulownia wood. Wood properties and behavior will most likely vary in regards to wood species in different process conditions. A number of studies show that the wood behavior changes under thermal compression depending on the anatomical structure of the wood (Navi and Girardet 2000; Kutnar et al. 2009; Dogu et al. 2010; Ou et al. 2014; Tu et al. 2014; Dogu et al. 2015; Beckhta et al. 2016; Budakcı et al. 2016; Dogu et al. 2016). To evaluate the success of thermal compression methods, the effects of the anatomical structure are important to know and understand. 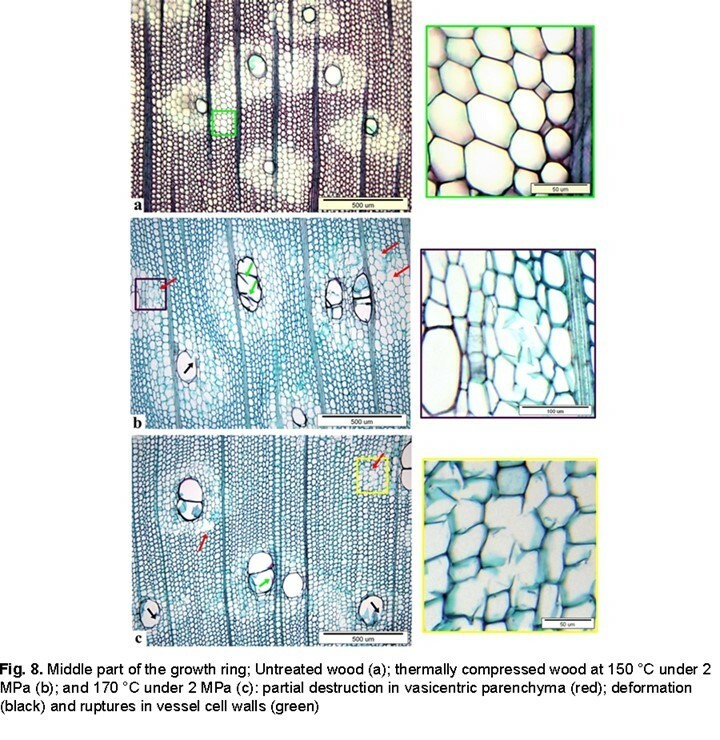 The objective of this study is to clarify why no densification occurred in paulownia wood panels subjected to thermal compression in a previous work performed by Candan et al. (2013). Therefore, the central focus of this research is to understand the behavior of paulownia wood under thermal compression depending on the changes in the microstructure of the wood. Test materials were taken from previously thermally compressed panels by Candan et al. (2013). Commercial paulownia solid wood panels without defects and with dimensions of 500 mm in length (grain direction) × 100 mm in width (radial direction) × 20 mm in thickness (tangential direction) were hot-pressed in a tangential direction (Fig. 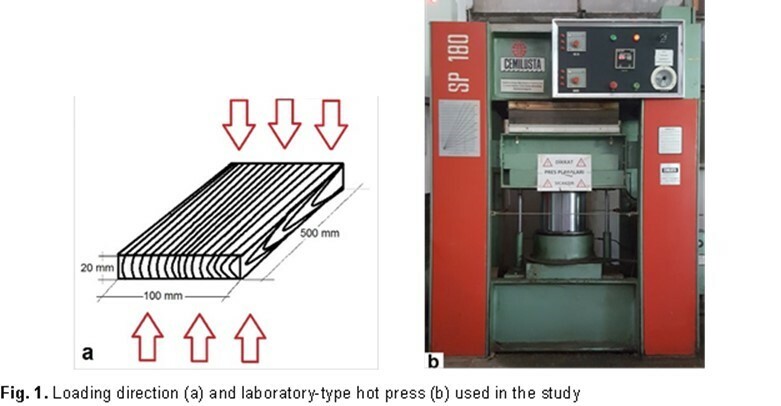 1a), using a laboratory-type hot press (Cemil Usta, Istanbul, Turkey) (Fig.1b) at a temperature of either 150 °C or 170 °C and a pressure of 2 MPa for 45 min (Candan et al. 2013). A total of 6 panels (two compressed panels from each treatment group and two untreated panels) were tested. The panels were pre-dried to a moisture content of 13% before hot pressing. The growth ring boundaries of paulownia wood are distinct and ring-porous or semi-ring-porous. The vessels are mostly solitary and in radial multiples of two or three cells. The vessel outlines are angular, rounded, or elliptic. Additionally, the perforation plates are simple. The difference in the vessel size between earlywood and latewood is three to five times. The tyloses in vessels are present and thin-walled. The fibers are very thin-walled and seen more in the latewood than in earlywood. The rays are mostly composed of a single cell type (homocellular), but are occasionally composed of two or more cell types (heterocellular) with the square and upright cells restricted to marginal rows. The rays are 1 to 40 cells in height and 2 to 5 cells in width. Axial parenchyma is paratraheal and well developed in the wood. These cells are banded or not banded, but the bands are common in the growth ring. The bands are much wider than the rays and are more than three cells wide. Axial parenchyma bands are as wide as the earlywood pore ring in the beginning part of the growth ring. Axial parenchyma are also vasicentric, aliform, or confluent in the latewood part of the growth ring. The cell walls of the parenchyma are thinner than that of the fiber cells (Zhao-Hua et al. 1986; Richter and Dallwitz 2000; Ates et al. 2008; Kaymakci et al. 2011). Paulownia wood has a lower fiber amount and a higher content of parenchyma cells (Ates et al. 2008). Paulownia wood is very porous and the cell tissue is similar to a honeycomb structure (Li and Oda 2007). Microscopic images of paulownia wood are shown in Fig. 2. Light microscopy was employed to reveal changes in the microstructure of the wood panels subjected to varying thermal compression conditions. Panel samples with dimensions of 10 mm (radial) × 10 mm (tangential) × 20 mm (longitudinal) were cut from the transversal surface of the panels for microscopic evaluations. The samples were kept under a vacuum with the mixture of alcohol:glycerin:water (1:1:1) at room temperature to soften the wood structure. Then, the wood was cut into thin sections (approximately 20 µm to 30 µm) by using a sliding microtome (SM 2010R, Leica, Wetzlar, Germany). Since the microtome knife had to be sharp and free of nicks to minimize the surface roughness and to avoid any possible damage on the surfaces of the samples, the microtome knife was frequently changed. A double staining method with safranin and fast green was applied on the microscopic sections to obtain a good contrast between the cell wall components. Microscopic sections were stained with safranin, rinsed in ethanol series, counterstained with fast green, rinsed in ethanol, cleared with xylene, and mounted in Entellan® (Wilcox 1964; Ruzin 1999). While safranin is an indicator for lignin in this staining method, fast green reveals the cellulose. Safranin stains lignin to red and fast green stains cellulose to green. The microscopic sections were observed under an Olympus BX51 Light Microscope (Olympus, Tokyo, Japan). The images were taken with the use of AnalySIS FIVE Software (Olympus, Version 5.0, Tokyo, Japan) and a DP71 Digital Camera (Olympus, Tokyo, Japan) installed and adapted on the microscope. In the evaluations, micro-defects in the thermally compressed wood structure were only taken into account if they were observed repeatedly and they were not a typical feature in untreated wood. No visible distortion in the plane of the growth rings was seen for the two treatment groups (Fig. 3). In contrast, a slight wavy pattern was seen in the growth ring boundaries of the wood samples treated at 170 °C under 2 MPa (Fig. 3c). It was assumed that this probably occurred because of the buckling on the tangential cell walls of fibers and axial parenchyma cells located in the last part of the growth rings (Fig. 6c). The compression in the tangential direction was considered as one of the main reasons for the buckling seen on the tangential walls of the respective cells. Previous studies completed under the radial compression technique showed that the buckling on the radial cell walls of the wood cells that occurred in the initial part of the growth rings resulted in a wavy pattern in the relevant region (Tabarsa and Chui 2001; Dogu et al. 2010; Ou et al. 2014; Dogu et al. 2016). Previous studies revealed that tangential compressions lead to the buckling of the latewood regions, whereas radial compression produces buckling in the earlywood cells first (Persson 2000; Tabarsa and Chui 2001). It can be concluded that the loading direction of the compression greatly affects the localization and the direction of cell wall deformation. Minute cracks (cleft formation in the cell wall) and ruptures (tearing formation in the cell wall without fragmentation) in the cell walls and separations between the compound middle lamella were observed in almost all of the fiber cells in the growth rings for both process conditions (Figs. 4 through 6). Bending and buckling were seen on the cell walls of some fibers throughout the growth ring for each process condition. These structural alterations were much clearer in the last part of the growth rings at 170 °C under 2 MPa (Fig. 6). Although fiber cells were observed to be very thin-walled throughout the growth ring, no uniform distribution in the bending and buckling of those cell walls was observed. It is known that cells’ shape and their connectivity have a major effect on the strength properties of the cellular materials (Silva and Gibson 1997; Thotakuri 2004; Li et al. 2006). The shapes of the fiber cells were nearly hexagonal or rounded (Figs. 4 through 6), except for a few cell rows in which fibers located in the last part of the growth rings were radially flattened and in a rectangular shape, as shown in Fig. 6. Thotakuri (2004) had noticed that when hexagonal cells are compressed in a radial direction, the inclined edges of the cells collapsed due to a bending formation. In contrast, when the cells were compressed along the tangential direction, the horizontal edges of the cells that lined up with the load provided a better and more compressive resistance than did the inclined edges. There were also some comments that explained the behavior of the rounded wood cells under the external stresses. In compression wood, the rounding of cells is considered an indication of the resulting function of strengthening tissues, so as to overcompensate for the compression stress (Yoshizawa and Idei 1987; Meyers and Chen 2014). It was thought that non-uniform distributions of bending and buckling in the fiber cell walls were largely related to the cell shapes of the wood panels in this study. The vessels were almost in their normal angular or oval shape throughout all of the growth ring for each process condition (Fig. 3). Those cells showed less damage, particularly in the beginning and the last part of the growth rings in comparison to the other parts. However, the vessels located in the zone between these two parts of the growth ring exhibited more damages. Cell wall deformation and ruptures were typically seen in those cells (Figs. 4, 7, and 8). Such damages were also more distinct in the vessels arranged in the radial rows of two or more multiples than in the solitary vessels (Figs. 4 and 7). It was interpreted that the wall of the two adjacent vessels was weakened by the existence of multiple bordered pits. Previous studies conducted on compressed wood showed more defects in the earlywood vessels compared to the latewood The presence of thin-walled axial parenchyma cells that surrounded the thinwalled and relatively large diameter vessels in the earlywood region were generally thought to be the reason for higher deformation in the respective cells (Tabarsa and Chui 2001; Ellis and Steiner 2002; Ou et al. 2014; Budakcı et al. 2016; Dogu et al. 2016). Similarly, the vessels in the current study were not deformed equally throughout the growth ring. It was noticeable that the occurrence of deformation depended on the vessel groupings and the vessels’ surrounding tissue in the growth rings. The vessels located in the axial parenchyma bands were in much better condition (Figs. 3 and 7) than the vessels surrounded by the vasicentric axial parenchyma cells (Fig. 8). It can be concluded that the vessels were much more damaged where the partial destruction of vasicentric parenchyma were seen. Biziks et al. (2013) reported that the vessels in birch wood were the least changed cell type from the thermal treatment process due to the lignin structure in the cells. Vessel walls contain mainly guaiacyl lignin units, a component that is much more stable in thermal treatments. In the current study the vessel walls appeared in red color, which indicated that the lignin structures remained without much change at both process conditions (Figs. 3, 4, 7, and 8). The effects of the treatment parameters were relatively small on the vessel walls of paulownia wood. The banded axial parenchyma cells in the beginning and end part of the growth rings showed less damage than the other parts. Bending and buckling of the tangential cell walls and ruptures were observed in those cells (Figs. 4 and 6). In addition to these damages, partial destruction of the axial parenchyma cells that surrounded a solitary vessel or multiple vessels was also detected (Fig. 8). Although the cell walls of the axial parenchyma were visually quite thin, the distribution of deformation in those cell walls was not uniform. The banded axial parenchyma in the latewood region showed long and broad bands and their cell shapes were almost hexagonal (Fig. 7). The appearance of the fiber cells with thicker walls formed relatively wider and darker bands at below and above side of banded axial parenchyma. 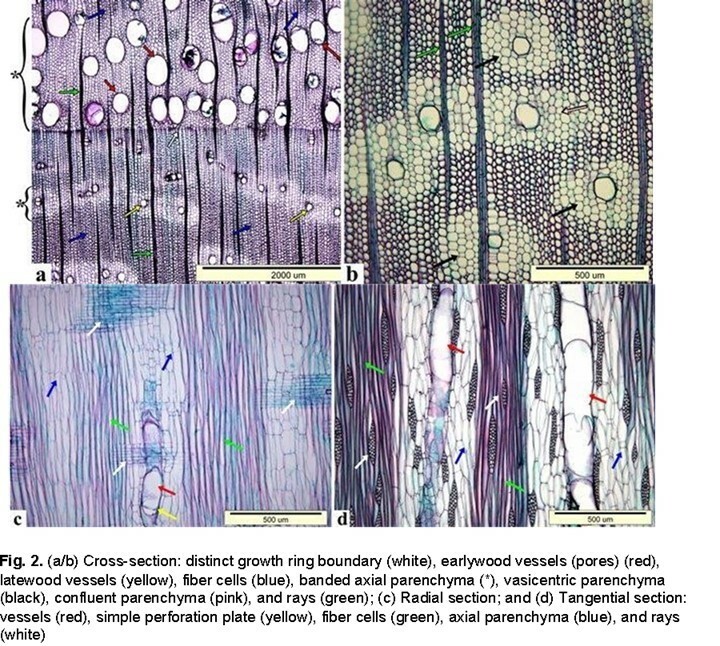 The successive banded structures of the axial parenchyma and fiber cells resembled the earlywood (axial parenchyma cells) and latewood region (fiber cells) patterns of softwoods (Fig. 7). Previous studies noticed that the latewood regions behaved like columns spaced by more flexible earlywood regions through tangential compression (Bodig 1965; Kennedy 1968) and that the latewood region was also the load controlling factor during tangential compression (Schneeweiβ and Felber 2013). However, the participation of the earlywood regions in the support of the load was not as important as the lateral support of the latewood regions (Schneeweiβ and Felber 2013). In the recent study, the successive structures of the banded axial parenchyma and fiber cells behaved like the earlywood and latewood regions of softwoods and resulted in a low degree damage of the banded axial parenchyma cells. As shown in Figs. 3 and 4, the banded axial parenchyma, located in the earlywood region were as wide as the earlywood pore ring and their cell shapes were hexagonal. As stated previously, hexagonal cell shape provided a much better compressive resistance in the tangential direction. Vasicentric parenchyma gathered around the vessels in the form of a ring and were surrounded by the fiber cells. It was thought that the internal stress distribution was not uniform between those of the two cell types; therefore, a greater extent of damage occurred in the vasicentric parenchyma cells (Fig. 8). Although the rays almost seemed to be intact in the cross-section (Fig. 3), separations and ruptures were detected in the ray parenchyma cell walls of the longitudinal sections for both process conditions (Fig. 9). This study showed that slightly more damage occurred in the thermally compressed samples at 170 ºC under 2 MPa than the samples compressed at 150 ºC under 2 MPa and that the distribution of defects were not uniform in the growth rings of the two treatment groups. Even though cell collapse was not observed in the current study, varying levels of defects occurred in all of the wood cell types, dependent upon the process conditions. Bending and buckling in the cell walls of the fibers and axial parenchyma were interpreted as an indication that cell collapse would occur. It is known that cell collapse is an inevitable formation in the process of wood densification (Kutnar et al. 2009; Tu et al. 2014). Candan et al. (2013) indicated that the thermal compression could not generate an increase in density. Conversely, the mean density value of paulownia wood decreased from 0.217 g/cm3 to 0.202 g/cm3 for 150 ºC under 2 MPa and to 0.198 g/cm3 for 170 ºC under 2 MPa process conditions. It is clear that the results of both studies were compatible with each other. Ellis and Steiner (2002) reported that the compression of low-density woods resulted to a smaller thickness than high-density woods. In other words, low-density wood species can be readily compressed by applying less force than for providing high-density boards (Walther 2003). Previous densification studies performed on low-density hardwood species under radial compression methods revealed that densification completed by the cell collapse was most frequently seen in the earlywood regions of poplar (Tabarsa and Chui 2001; Kutnar et al. 2009; Ou et al. 2014; Tu et al. 2014; Budakcı et al. 2016; Dogu et al. 2016) and linden (Budakcı et al. 2016) wood. In accordance with this knowledge, cell collapse and more or less densification were expected in paulownia wood due to its very low-density. In the current study, wood panels were thermally compressed in the tangential direction. As known, wood exhibits different behavior in radial and tangential compression (Bodig 1965; Kennedy 1968; Tabarsa and Chui 2001; Schneeweiβ and Felber 2013). The earlywood to latewood ratio and ray volume are important parameters to explain these differences. The loaded specimen’s radial to tangential strength ratio increased with a higher ray volume and decreased with the latewood proportion (Kennedy 1968). Ring-porous wood species have partially higher latewood proportions while diffuse porous wood species have generally less latewood portions in the growth ring. Therefore, the radial strength of diffuse porous woods is higher than the tangential one due to the supporting effects of rays (Kollman 1951; Wolcott 1989). The difference between the radial and tangential strength in the ring-porous woods may be less (Kollman 1951) or the tangential strength is higher than the radial one depending on the latewood proportion with thick walled cells (Bodig 1965; Ellis and Steiner 2002). 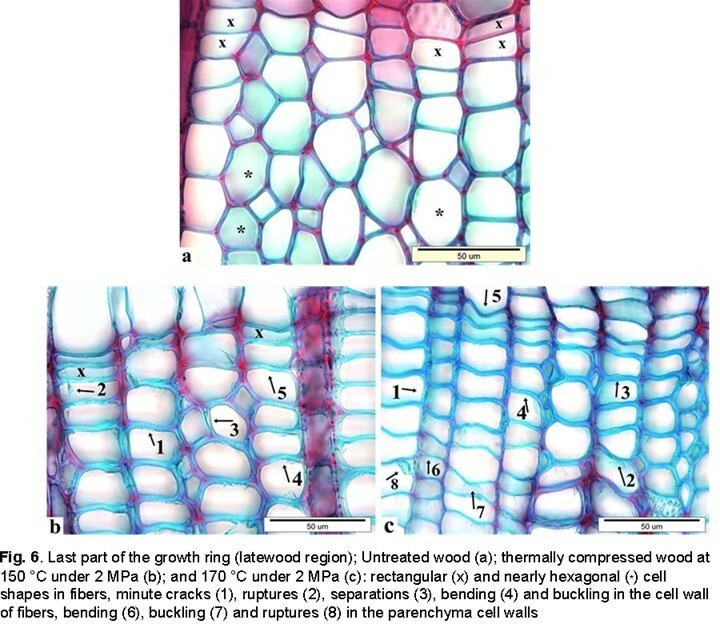 In the current study, the wood samples showed visually much wider growth rings and latewood regions, with thin-walled fiber cells located throughout the growth rings. The amount of parenchyma cells (53.8%) in paulownia wood was found to be higher than fiber cells (Ates et al. 2008). In this case, it was expected that the tangential strength of paulownia wood was low enough to lead to cell collapse. However, this expectation did not occur which was an exceptional situation in the study. The arrangement of the cells in the wood is known as an important factor for the cell’s overall behavior and reaction towards stress (Walther 2003). The cell shape is another factor that helps explain the difference between the strength of wood in the radial and tangential direction (Gibson and Ashby 1997). According to this information and the authors’ microscopic observations, this phenomenon could have been explained by the arrangement of fibers and axial parenchyma cells in the growth rings, and the cell shapes in the cross-section plane. The presence of successive tangential banded structures of very thin-walled axial parenchyma and relatively thicker walled fiber cells in the latewood region, and also in the hexagonal cell shape in the cross-section plane, played a major role in preventing the cell from collapse. The results of the study showed that the damage features in the cell walls were promoted by increased temperature. Candan et al. (2013) reported that water absorption and thickness-swelling values of the thermally compressed paulownia wood were noticeably higher than the control wood. However, heat treatment is known as a useful method to reduce the hygroscopicity of wood (Esteves and Pereira 2009). The improvement in the dimensional stability is linked to considerable changes in the chemical composition of wood, especially the degradation of amorphous carbohydrates (Fengel and Wegener 1984; Boonstra and Tjeerdsma 2006; Awoyemi and Jones 2011). It was clear in the images from the light microscopy that distinct changes in the chemical composition of paulownia wood occurred. The decrease or disappearance of red color in the images indicated that there were some modifications in the lignin structure, especially of the fiber cell walls (Figs. 5, 6, and 8). It was thought that the hygroscopicity of thermally compressed paulownia wood was more affected by the changes in microstructure than the changes in the chemical composition of wood. Therefore, the minute cracks, ruptures, separations in the cell walls, and the destruction of vasicentric axial parencyma were interpreted as the sources of the increased hygroscopicity of wood. The results of the study have raised an opinion that paulownia wood resembles balsa wood in regards to its light weight and the occurrence of hexagonal cell shapes in the microstructure. It is known that balsa is one of the best core materials to use in sandwich composites with its excellent stiffness-to-weight and the strength-to-weight ratios. These properties are derived from the microstructure, which consists of tracheid cells with approximately hexagonal cross-sections arranged axially (da Silva and Kyriakides 2007). It might be useful to focus on the possibility of using the paulownia wood as a core material instead of balsa wood in future studies. Slightly more damage occurred in thermally compressed samples at 170 ºC under 2 MPa than in the samples compressed at 150 ºC under 2 MPa. The damage in the cell walls was promoted by increased temperature under the same press pressure and the distribution of defects were not uniform in the growth rings of the two treatment groups. Cell collapse in the microstructure of wood was not observed in the thermal compression conditions (150 ºC or 170 ºC, 2 MPa) followed in the study. The arrangement of different cell types and their shapes in the growth ring, and the compression direction were considered as effective factors for the non-uniform distribution of damages and lack of cell collapse in the microstructure. Akyildiz, M. H., and Sahin Kol, H. (2010). “Some technological properties and uses of paulownia (Paulownia tomentosa Steud.) wood,” Journal of Environmental Biology 31, 351-355. Ates, S., Yonghao, N., Akgul, M., and Tozluoglu, A. (2008). “Characterization and evaluation of Paulownia elongata as a raw material for paper production,” African Journal of Biotechnology 7(22), 4153-4158. Bodig, J. (1965). “The effect of anatomy on the initial stress-strain relationship in transverse compression,” Forest Products Journal 15(5), 197-202. Bodig, J., and Jayne, B. A. (1982). Mechanics of Wood and Wood Composites, Van Nostrand Reinhold, New York. Dogu, D., Tirak, K., Candan, Z., and, Unsal, O. (2010). “Anatomical investigation of thermally compressed wood panels,” BioResources 5(4), 2640-2663. Dogu, D., Tirak Hizal, K., Bakir, D., Tuncer, F. D., Candan, Z., and Unsal, O. (2015). “Anatomical structures of thermally compressed paulownia (Paulownia spp.) wood,” in: Proceedings of the 58th International Convention of Society of Wood Science and Technology, Jackson, Wyoming, USA, pp. 304. Dogu, D., Bakir, D., Tuncer, F. D., Tirak Hizal, K., Unsal, O., and Candan, Z. (2016). Fengel, D., and Wegener, G. (1984). Wood: Chemistry, Ultrastructure, Reactions, Walter de Gruyter & Co., New York, USA. Jey, A. (1998). “Paulownia plantation experiences and profitable timber production,” in: Australian Forest Growers Conference Proceedings, Lismore, New South Wales, pp. 199-214. Kaymakci, A., Bal, B. C., and Bektas, I. (2011). “Some properties and uses of paulownia wood,” Kastamonu University Journal of Forestry Faculty 11(2), 228-238. Kennedy, R. W. (1968). “Wood in transverse compression,” Forest Products Journal 18(3), 36-40. Kollman, F. F. P. (1951). Technology of Wood and Wooden Materials (2nd Ed. Vol. 1), Springer Verlag, Berlin, Göttingen, Heidelberg, Germany, Reprint 1982 (in German). Richter, H. G., and Dallwitz, M. J. (2000). “Commercial timbers: Descriptions, illustrations, identification, and information retrieval,” Version: 25th June 2009, (http://delta-intkey.com/wood/index.htm), Accessed 18 January 2017. Ruzin, S. E. (1999). Plant Microtechnique and Microscopy, Oxford University Press, New York. Tabarsa, T., and Chui, Y. H. (2001). “Characterizing microscopic behavior of wood under transverse compression. Part II. Effect of species and loading direction,” Wood and Fiber Science 33, 223-232. Thotakuri, M. V. (2004). Transverse Compressive Properties of Honeycomb Core Under Oblique Loading, Bachelor’s Thesis, Department of Aerospace Engineering, Osmania University, Telangana, India. Walther, T. (2003). The Influence of Moisture Content and Grain Orientation on the Compressibility and Recovery of Wood Particle, Master’s Thesis, University of Hamburg, Hamburg, Germany. Wolcott, M. P. (1989). Modeling Viscoelastic Cellular Materials for the Pressing of Wood Composites, Ph.D. Dissertation, Virginia Polytechnic Institute and State University, Blacksburg, Virginia. Yoshizawa, N., and Idei, T. (1987). 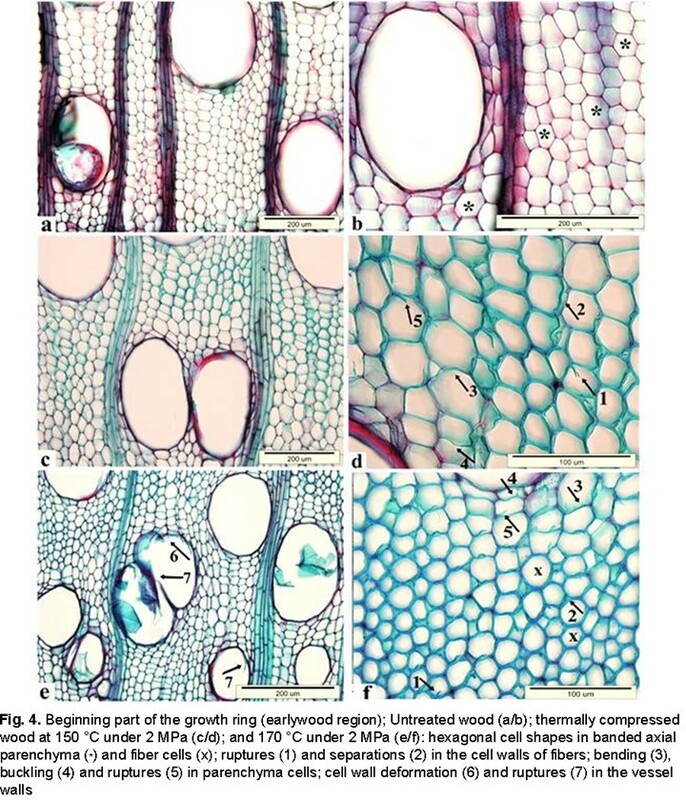 “Some structural and evolutionary aspects of compression wood tracheids,” Wood and Fiber Science 19(4), 343-352. Zhao-Hua, Z, Ching-Ju, C., Xin-Yu, Lu., and Yao Gao, X. (1986). Paulownia in China: Cultivation and Utilization, Chinese Academy of Forestry, Asian Network for Biological Sciences and International Development Research Centre, Beijing, China. Article submitted: March 9, 2017; Peer review completed: May 22, 2017; Revised version received and accepted: June 2, 2017; Published: June 6, 2017.